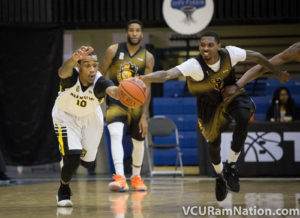 Team Ram Nation got a huge win in the round of 32 against Kings of the South to advance to the sweet 16 in the 102-76 victory on Sunday evening. In a game that saw all but two players score in double digits it was Darius Theus who led the team in scoring with 27 points. Player/Coach Joey Rodriguez saw 11 minutes of action, giving Ram Nation teammate Reggie Williams (6 year NBA player, VMI) additional coaching responsibilities from the bench. Team Ram Nation will play in Philadelphia on Thursday, July 21st, time TBD.